The results of the experiment appear in the April 30 advanced online edition of the journal Nature. Dr. Michael Laflamme, UW assistant professor of pathology, and Dr. Charles (Chuck) Murry, professor of pathology, bioengineering and medicine/cardiology, in the Murry Lab at South Lake Union. 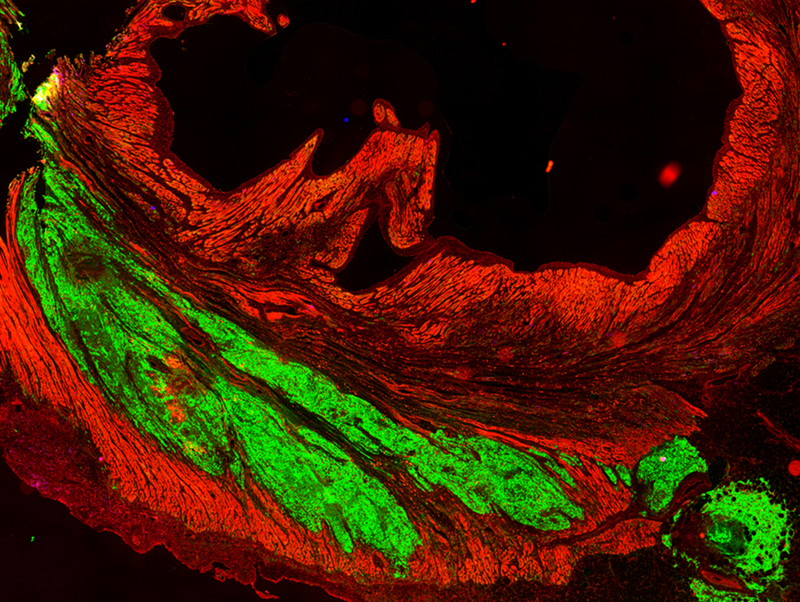 The graft (white area) is visible in this image of the primate heart's vasculature. James J.H. Chong was the paper’s lead author. Murry was the paper’s senior author. Their co-authors were Xiulan Yang, Creighton W. Don, Elina Minami, Yen-Wen Liu, Jill J Weyers,William M. Mahoney Jr., Benjamin Van Biber, Nathan J Palpant,Jay Gantz,James A. Fugate, G. Michael Gough, Keith W. Vogel, Cliff A. Astley, Charlotte E. Hotchkiss, Lil Pabon, Hans Reinecke, Edward A. Gill, Veronica Nelson, Hans-Peter Kiem, and Michael A. Laflamme. Murry expressed gratitude to philanthropic donors who have supported UW Institute for Stem Cell & Regenerative Medicine and his work, including Jeff and Susan Brotman, Bill and Marilyn Conner, Tom and Sue Ellison, Mike and Lynn Garvey, the Oki Foundation, the Quellos Group, the Orin Smith Family Foundation and the John H. Tietze Foundation Trust. This work was supported by NIH grants P01HL094374, R01HL084642, U01HL100405, and P01GM08619 and an Institute of Translational Health Sciences/Washington National Primate Research Center Ignition Award. J.C. was supported by National Health and Medical Research Council of Australia Overseas Training and Australian-American Fulbright Commission Fellowships. X.Y. is supported by an American Heart Association post-doctoral scholarship 12POST11940060. J.J.W is supported by an American Heart Association post-doctoral scholarship 12POST9330030. Washington National Primate Research Center is funded by the NIH, Office of Research Infrastructure Programs (ORIP P51 0D010425). High-resolution photos are available for download in NewsBeat's Breaking News Photo Gallery. Video: A brief interview with Murry, followed by b-roll, is available for download. Contact Leila Gray (info above) for access.